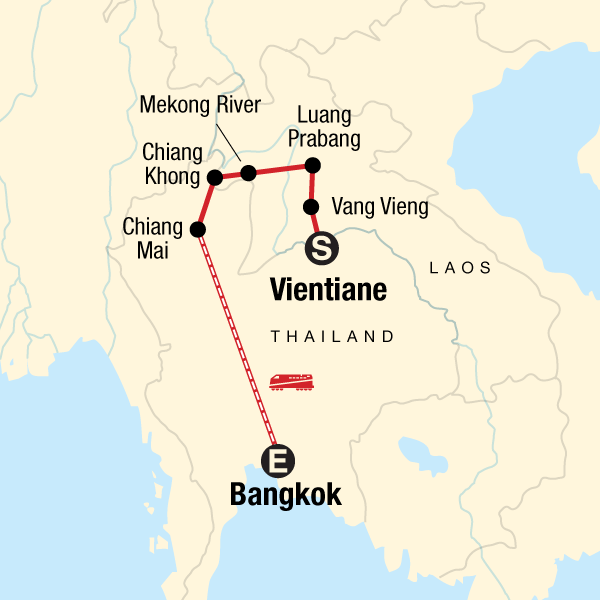 There’s more than one way to get to Bangkok from Hanoi as this 12 day budget tour to Laos and Thailand goes to prove. Travel by air, bike, slow boat and overnight sleeper train and uncover budget tours to Laos and Thailand that are as much about actual travelling as they are about saving holiday funds for something really special. This 12 day budget tour to Laos and Thailand is all about travelling like a local with free time to explore offering an excellent combination of organic experiences and optional activities. From the peaceful monastic settings and French influence within Luang Prabang to the banks of the Mekong River and the limestone karst landscapes of Vang Vieng, this budget tour to Laos and Thailand lets you experience the very best of Southeast Asia at a price to suit all pockets. Low Impact Transportation: This trip gives you the chance to try out the slow boat on the Mekong from Luang Prabang to Huay Xai to and overnight sleeper train from Chiang Mai to Bangkok. Getting around as the locals do not only allows you to experience the culture on a deeper level, but the same way it is at home, using public transport is the most sustainable way to go – after walking and cycling of course! Supporting local culture and businesses: There are a multitude of opportunities to support local businesses and immerse yourself into the culture of Indochina on this trip. From the colourful markets to the bustling food stalls and cafes, the choices for eating and handicrafts are endless and the money is staying in the local economy - a vital way for tourism to make a positive impact. Activities that take you to markets, locally-owned restaurants, locals’ homes and villages are vital to the local peoples’ ability to truly benefit from tourism. Our style of trip, travelling, eating and staying with the locals, puts you right at the heart of the culture in Vietnam, Lao and Thailand. In Hanoi you have the chance to explore local food while eating on small plastic chairs on the street, or café da, Vietnamese ice coffee or if you like join in with the locals drinking Bia Hoi (cheap fresh beer also served on the street or in small local shops). On the slow boat up the Mekong you have the option for a great local lunch cooked on the boat by the family. Chatting with the locals will give you an amazing insight in local life. It may not be apparent that learning about and respecting other cultures is part of being a responsible traveler, but we believe that this discovery is a natural way for people of all backgrounds, nationalities, and religions to interact and learn from each other, fostering peace and understanding. And it’s just plain fascinating! Other optional unique experiences on this trip that allow you to support the local economy and learn about South East Asian culture include: Bike ride in the country side of Vang Vieng with its beautiful lime stone karst mountains exploring the Lao life outside the town. Get up early in the morning in Luang Prabang to see the monks collecting alms or in Hanoi seeing the locals doing exercise.